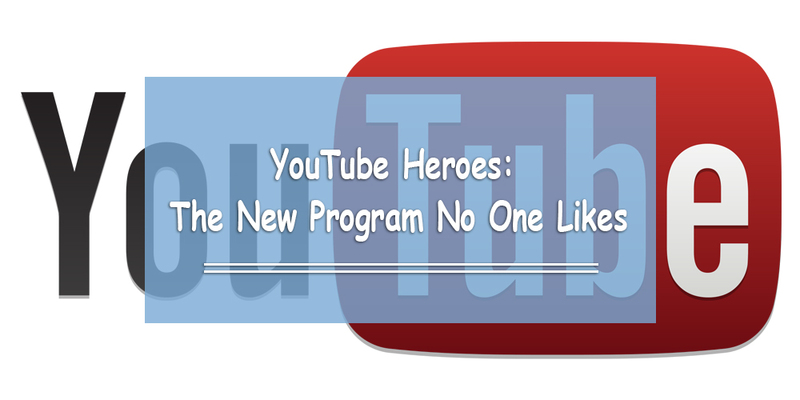 So, if you’re part of the YouTube community or follow social media trends, you may have heard that YouTube is going to launch a new program called #YouTubeHeroes. It received a LOT of criticism to say the least; it’s received nearly 1 million dislikes as of February 2017. As YouTube community members, many of us watch several YouTube videos every day. Because this impacts a number of people who have stayed loyal to YouTube, we believe it’s important to take a stance on the issues. There are some good things and some bad things, and we’d like to highlight them both in this message. 2. Gamification: Holistically, this is a great concept to motivate YouTube users to regulate their own community. In a way, they’re giving back and showing appreciation to the people who watch the same videos. Rewarding people for these efforts by giving them exclusive offers/sneak peaks at new products is undoubtedly a good thing. More importantly, however, are the harsh criticisms YouTube has received. We believe YouTube needs to be more forward in what kinds of videos YouTube Heroes should report. Right now, it is still quite vague, which explains why many people are outraged by the decision to allow YouTube users the privilege of flagging a video. There is a difference between videos that are inappropriate for advertisers and videos that are inappropriate for YouTube. After watching the video above, many people are left wondering cynically what these YouTube ‘heroes’ will do once they can flag videos. -Can the average YouTube user really be fully trusted with the maintenance of any website (let alone YouTube)? -What if these ‘heroes’ take advantage of these privileges and starting flagging videos of content creators they simply disagree with? -How will mass flagging work? How can it be prevented? These are some of the critical questions YouTube (and its community) needs to have a discussion about. Using gamification for certain aspects of YouTube is a good idea. It allows the YouTube community to run itself. It can potentially solve problems to which several YouTubers have spoken: plagiarism, removing ‘extremist’ content, and the inconsistencies of flagging videos (just to name a few). We thank you and admire the effort you put into trying to provide a tangible solution. However, this strategy needs to be moderated and implemented fairly… and that can’t be done by simply allowing anyone to moderate the community. If you’re looking for the community to help, I’m sure many people would love to do so. However, we need to be assured that ‘heroes’ (or a group of heroes) who flag videos are doing as objectively as possible with minimal cognitive bias.